Watching educational movies is the helpful and effective way to learn blackjack or get acquainted with gambling activities in whole. They possess more fun than the educational books reading indeed. Just lean back your favorite chair, relax and enjoy your study. Plus you may watch blackjack tournaments broadcast live or enjoy motion pictures thematically connected with casino card gaming. Thus the chief aim of educational movies is to instruct the person on the subject of how to play blackjack (or else). Generally these films are documentary and possess less entertainment than the art movies. This movie deals with blackjack card game strategies and rules. It helps the player to understand the basic game mechanisms. This media aims is to increase the player chances for winning. The mentioned film presents an overview of basic blackjack strategy and helps the player to win more often and more effective. It analyzes the hit and stand situations, aid the player to lengthen the game and increase the bankroll. 60 Minutes to Winning Blackjack - 2005. Basic tips and strategies review is found in this book. Also it possesses a practice mode for player to try his/her skills and knowledge. "Cinema is the most important art" - once been said. It's hard to be in opposition to this statement. Movies entertain us and teach us (at the best); occupy our thoughts, transform our ideas, form our ideals. Motion picture is a powerful influence tool, the proper application of which may produce instant effect. In this article we present at least two movies which are considered the most popular and qualitative. They produce a lot of joy and interest for audience. 21(2008 film) - the drama film directed by Robert Luketic starring Kevin Spacey and Laurence Fishburne. The movie plot is based on a true story. Due to Hollywood stars feature this film and amusing storyline - this piece of art is very popular among the audience. 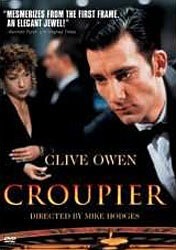 Croupier - is a 1998 film about casino croupier (starring young Clive Owen) directed by Mike Hodges. The storyline is rolled around the dealer life. The films presented below cannot be taken as educational ones. Also there still a lot of other motion pictures which can be reckon as "casino theme movies." It's quite enough to recollect (at least) incredible Casino (1995 film) by Martin Scorsese.